The BodySpace Member of the Month for October 2006 is Cris Edmonds (lbdb18). Congratulations, Cris! Cris was chosen because he is using every single applicable feature of BodySpace, and doing it with style! Check out his lifting stats, photos, & more! The BodySpace Member of the Month for October 2006 is Cris Edmonds (lbdb18). Cris was chosen because he is using every single applicable feature of BodySpace, and doing it with style! Check out his lifting stats, photos, & more below! Cris Edmonds (lbdb18) started using BodySpace in September, just over a month ago. He's from Roanoke, Virginia, USA, and has been lifting weights since 2002. He started working out when he got into high school, mainly to help improve for football. 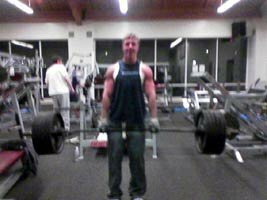 In the school gym, they really only focused on the bench press, power clean, and squats, so it wasn't really true bodybuilding. After graduation, however, he started reading Flex Magazine, and that's when he really got serious. Cris now lifts at Gold's Gym, Roanoke College, and BAC in Roanoke, VA. If you see him and his training partner, Ari, in the gym, don't forget to say "Hi!" Cris Doing Shrugs With 495 Lbs! To View Cris's BodySpace Profile, Click Here. To View Cris's BodyBlog, Click Here. Well, it's pretty simple actually - we're looking for profiles that are using every applicable feature, including the photo gallery, favorite videos, favorites, blog, stats, etc. We're also looking for well-written content that uses correct spelling, capitalization (NO UPPERCASE YELLING), punctuation, grammar, etc. both in the blog and profile sections. If you think you have what it takes to be a future BodySpace Member Of The Month, send a PM to BodySpaceAdmin, and we'll take a peek!